Losing your home or personal property to a natural disaster is something that no one wants to experience. 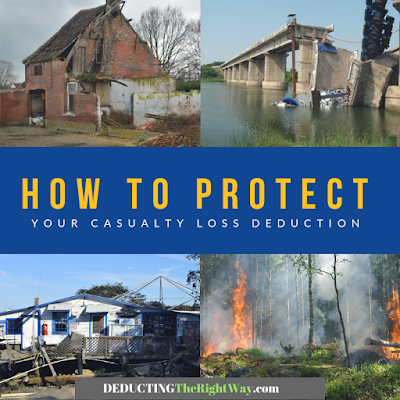 The casualty loss deduction is one way to recover from the event, but you must complete the proper steps to protect your tax deduction. #1 Be located in a disaster zone. Beginning in 2018, you can only deduct casualty losses that take place in Federally Declared Disaster Areas per presidential orders. Few exceptions exist, so if your property is outside the disaster area, then you are out of luck. Review the FEMA maps. #2 Secure your property (a/k/a mitigation). You must protect your property, so it does not suffer further damage. If you do not take the necessary precautions, the insurance company might deny your claim in part or in full. It makes proving your casualty loss to the IRS that much harder. #3 Call your insurance company. To preserve your eligibility for a tax deduction, you need to file an insurance claim. Any property covered by an insurance policy must go through the claims process. Otherwise, you may give up your right to deduct the loss. If you do not have insurance, then you must get quotes from licensed contractors to repair or replace the damaged items. TIP: To qualify for the storm damage deduction, you must meet several tests. \n#1 Be located in a disaster zone. Beginning in 2018, you can only deduct casualty losses that take place in Federally Declared Disaster Areas per presidential orders. Few exceptions exist, so if your property is outside the disaster area, then you are out of luck. Review the FEMA maps. \n\n#2 Secure your property (a/k/a mitigation). You must protect your property, so it does not suffer further damage. If you do not take the necessary precautions, the insurance company might deny your claim in part or in full. It makes proving your casualty loss to the IRS that much harder. \n\n#3 Call your insurance company. To preserve your eligibility for a tax deduction, you need to file an insurance claim. Any property covered by an insurance policy must go through the claims process. Otherwise, you may give up your right to deduct the loss. If you do not have insurance, then you must get quotes from licensed contractors to repair or replace the damaged items. \nTIP: To qualify for the storm damage deduction, you must meet several tests.